It’s safe to say that most people headed to Florida are looking for sand, sea, and sun — lots and lots of sun, a hot, glowing orb shining brightly across the broad ocean. Except of course, if you’re headed across the Florida Keys, from Key Largo to Key West, the 100-mile route along Highway 1, propelled only by your feet. And you are out there, running for hours and hours on end, to the south and to the west, directly into the setting sun, with nary a cloud in the sky to break the raw, shimmering heat. Then perhaps, that glorious Floridian sun becomes just a tad bit overwhelming. Otherwise, Jim and his running mates plowed on, running the 100 miles throughout the day and into the hot night, enduring the blistering heat even after the sun went down. It was an accepted part of the Keys 100, a 100-mile run that White and two other members of the Northern Kentucky running group, Pain By Numbers, participated in over the weekend. White, 50, finished in 29 hours and 50 minutes. Charles Ray Bell, a truck driver from Delhi, crossed the finish line after 25 hours and 47 minutes. 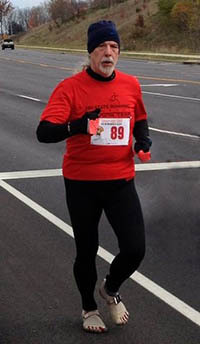 Melanie Wherry Owen, a health science researcher from Cincinnati, battled blisters and painful heel spurs before dropping out after 53 miles. Bell, 47, said after running 40 miles, he thought he was done. He trained well, having several back-to-back running days of 30 and 20 miles. 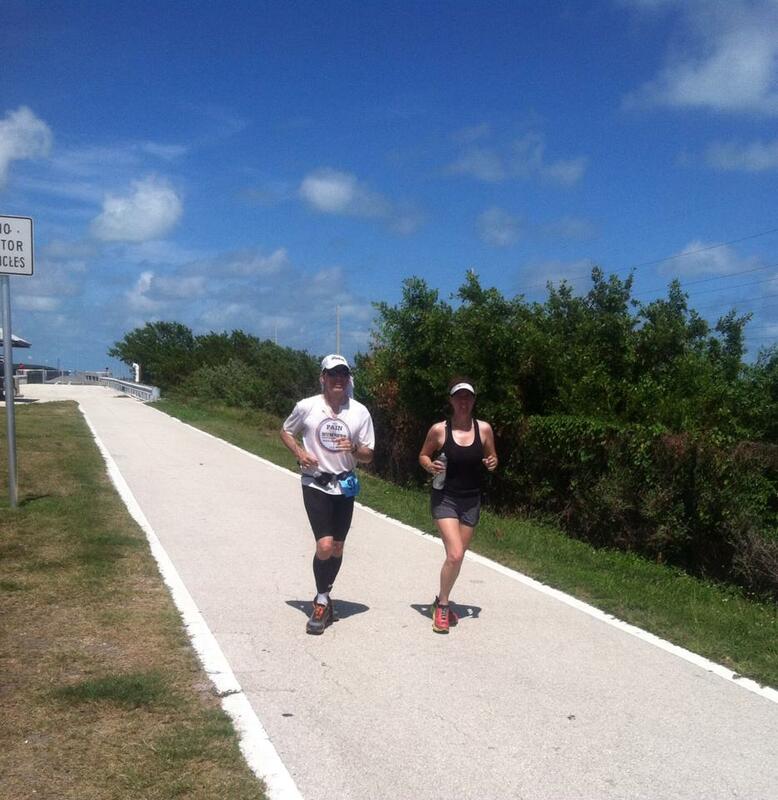 But this was his first 100-miler, and he wasn’t prepared for the heat. Taking his own break about the same spot in the road, White — a veteran ultrarunner with two previous 100-mile races behind him, no longer could resist the lure of the ocean. With the help of his crew members, he skirted some of the corals, and took a dip in the clear blue saltwater of the Atlantic Ocean. Both White and Bell credited their crew members — Jeff Harmon and Dianna Petry for White, and Emily Leising and Kyle Horseman for Bell. Crew members provide logistics and support for the runners, included getting their food and water during breaks, and ensuring their runners have enough to eat and drink. To help runners battle the heat, the crew filled bandanas with ice and hosed them down along the way. Sore muscles are massaged, and bruised and battered psyches are healed. Dry, clean clothes are provided along the way. Indeed, Petry ran some 20-plus miles with White, coaxing him along and pacing him during some especially trying moments deep into the run. Having a friend by your side, walking and running and supporting you, is invaluable, White said. Meanwhile, Leising and others took dozens of pictures and videos, and reported back home to other members of the Pain By Numbers running group about the run. Leising referred to her work as reporting for ESPBN. For both men, the final hours of the run was special. White said the reception of the Key West community was extraordinary. Running through the total darkness of the night was the highlight of the trip, he said. 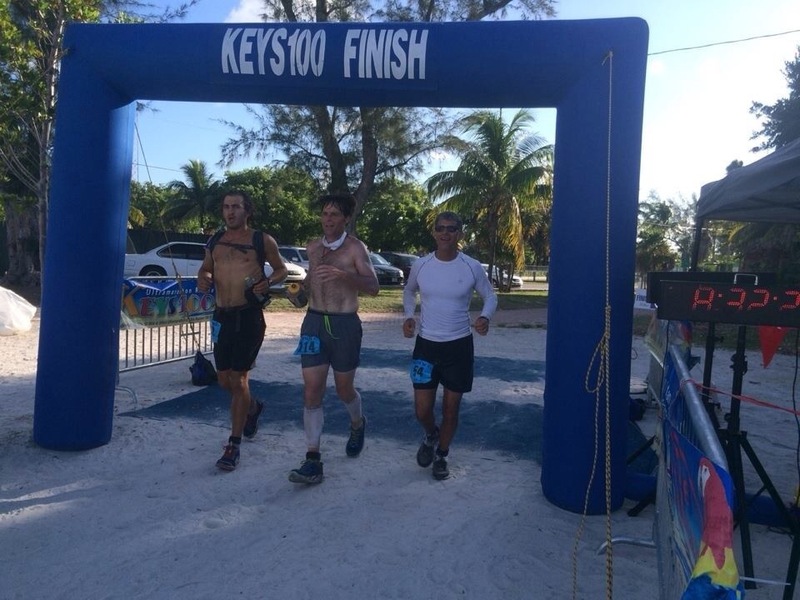 Bell said around the 75-mile marker, with about a marathon still to go, he met two other runners — a young man in his 30s doing his first ultra, and a veteran Key West resident who knew the course well from running it several times. The trio ran together through the night, and finished shortly after the sun rose on the next day.